Grammy nominated artist Charlie Puth will perform in Singapore 10 August! Charlie Puth is an American singer, songwriter, arranger, and record producer who began his career writing his own songs and eventually posting them on YouTube, along with covers. In 2011, Ellen DeGeneres tapped Puth and a friend to appear on her show after their cover of Adele’s “Someone Like You” went viral. Puth appeared on the show twice and watched his international fan base grow both on and offline. “It got me in front of 30 million people,” he says of the experience. “It pushed me into a different area I never thought I would reach.” In 2015, Puth signed with Atlantic Records and co-wrote, co-produced, and was featured on Wiz Khalifa’s Furious 7 ballad “See You Again” — a 4x-platinum smash that topped the Billboard Hot 100 chart for 12 weeks, tying the record for the longest run at No. 1 for a rap song, and became No. 1 in over 100 countries, while its video racked up more than a billion YouTube views. He followed that up with the British chart-topper “Marvin Gaye,” featuring Meghan Trainor, which gave Puth another platinum record and his second Top 40 hit in the U.S. Puth received an impressive three GRAMMY nominations in 2016, including the coveted ‘Song of the Year’ category that specifically recognizes songwriters. He wrote and produced songs for an array of A-list pop and urban artists, including Lil Wayne, Jason Derulo, Stevie Wonder, Megan Trainor, Trey Songz, and Fergie, among others. Entertainment Weekly called him “the next big thing in music,” while Forbes predicted Puth would become “a global superstar” — a forecast that seemed to be borne out during his promo tours in Europe and Asia. Puth has since worked with Max Martin on Nine Track Mind’s “Then There’s You” and returned to Ellen DeGeneres’ show to perform “See You Again” with Wiz Khalifa. As the final touch on the album, Charlie’s good friend and pop singer Selena Gomez added her vocals to the song “We Don’t Talk Anymore”. 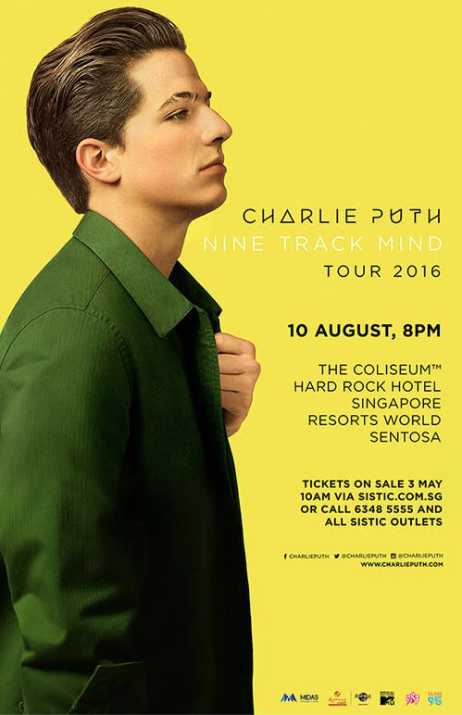 Catch Charlie Puth ‘Nine Track Mind Tour’ in Singapore this 10 August at The Coliseum! Tickets on sale 3rd May via sistic.com.sg or call +65 6348 5555 for SISTIC hotline.